Desert Safaris is a family owned business. Number one priority is offering some of the industry's premier hunting opportunities. Our number one priority is client satisfaction and strong relationships with our customers. Texas Game hunting trips have been compared to safaris in South Africa. "The adventure and accommodating nature provided by Desert Safaris has exceeded expectations each time!" 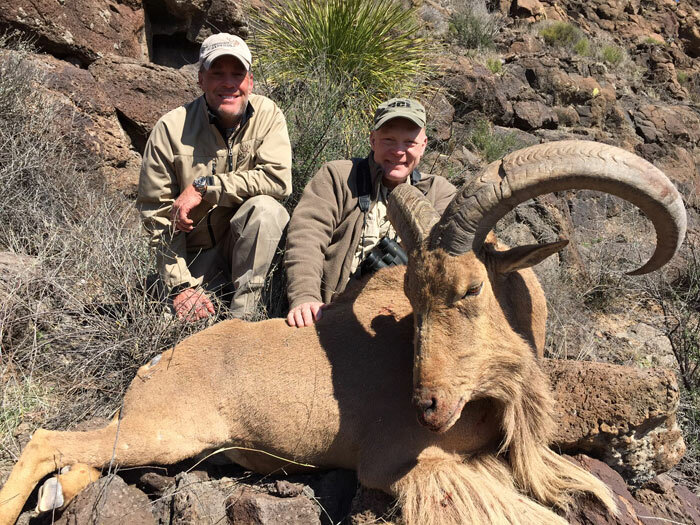 Hunter Ross of Desert Safaris is an extremely able young hunter and outfitter, operating primarily in the amazingly big mountains of West Texas, with some hunting in New Mexico. He is the superstar of free-range aoudad hunting, is doing an awesome job with desert mule deer, and has a couple of “sleeper” spots for big elk. I’ve hunted with him for aoudad, mule deer, and pronghorn…he’s fun to hunt with, and I love the big country he operates in. I don’t think it’s possible to beat the aoudad I took with him earlier this year…but we’re going to try in February!